Janice Santos, MD is a board-certified urologist in the Program for Pelvic Floor Disorders at The Women’s Medicine Collaborative. Dr. Santos also serves as an assistant professor of urology at The Warren Alpert Medical School of Brown University. Dr. Santos received her undergraduate and medical degrees from the University of Puerto Rico before completing a urology residency at the Albert Einstein School of Medicine, Montefiore Medical Center in New York. She trained in urologic oncology at the University of Miami and Jackson Memorial Hospital in Florida before pursuing a second fellowship in female urology, voiding dysfunction, urodynamics, and neurology at New York-Presbyterian Hospital/Columbia University Medical Center in New York. 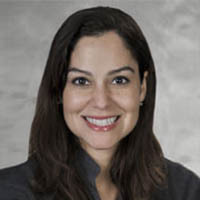 A member of the American Urological Association, the American Medical Association, the Society of Women in Urology, the Society for Urodynamics and Female Urology, and the Society of Urologic Oncology, Dr. Santos brings a rich background in urologic medicine to the Women’s Medicine Collaborative. Dr. Santos’ clinical interests include the medical and surgical treatment of female incontinence, vaginal prolapse, voiding dysfunction, urodynamics and surgical outcomes. She also has a special interest in the treatment of patients with neurogenic voiding dysfunction.